When it comes to getting your floors clean, many of the commercial cleaners you can buy at the store won’t cut it. Not only are they ineffective, but they are full of dangerous chemicals that can make your family sick, not to mention being harmful to the environment. The great news is that you probably already have all the ingredients you need to make a homemade floor cleaner sitting in your pantry, one that will clean just as good, if not better than a store-bought cleaner. Using a commercial cleaner when cleaning your floors dramatically contributes to indoor air pollution, which can be an enormous problem for those who suffer from asthma or allergies. 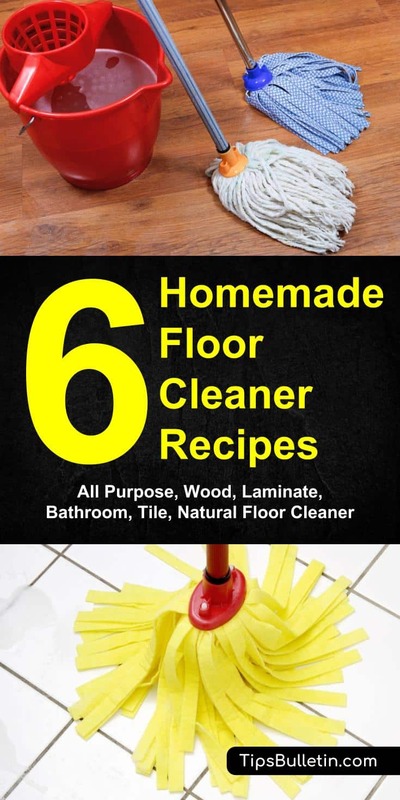 They also leave toxic residue behind, which can cause other dangerous health conditions, making your family ill. Making homemade floor cleaners are not only safer, but they are relatively inexpensive to produce. 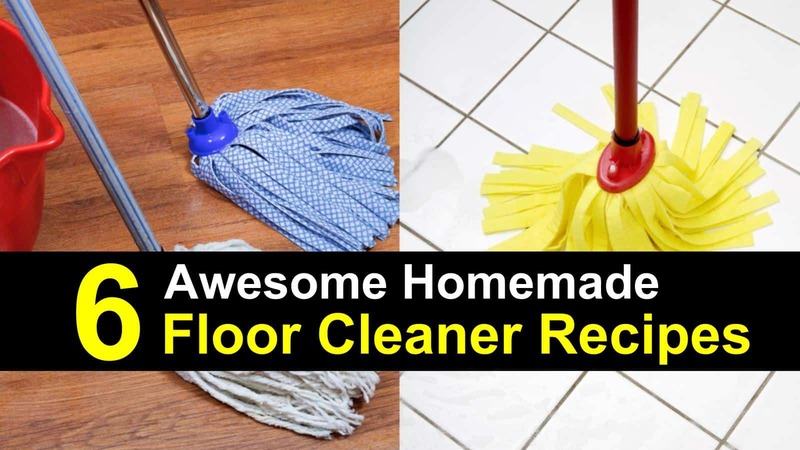 There are many reasons why making a homemade floor cleaner is a good idea. Not only is it better for the environment, but it is safer for your family. Using some basic ingredients that you can find in your kitchen, you can make a cleaner to tackle even the toughest of messes without leaving harsh chemicals behind. This fantastic cleaner will work on every hard flooring surface in your home. It will work on your hardwood floor, laminate, vinyl flooring, linoleum, and tile. Be careful to use it to clean marble and granite, since the vinegar might harm any porous stone. It’s a powerful cleaner for cutting through grime and leaves a gorgeous shine. Combine the ingredients in a large bowl. Add them to a plastic or glass spray bottle and shake well. Spray the cleaner on the floor and wipe with a mop. You can also combine the ingredients in a bucket, but you’ll have to dump out any leftovers once you’ve finished cleaning the floor. Note: Don’t swap castile soap for the liquid dish soap as it is an oil-based soap. Using castile soap will end up leaving your floor full of smears and streaks. With our homemade wood floor cleaner You can use warm water and a mop to clean your floors daily. If your wood floor is filthy, you can use this recipe to get it clean. This formula does double duty as it polishes your floor, leaving them with a beautiful natural sheen. Mix the ingredients in a bucket. Using a mop that you’ve thoroughly wrung out, apply the solution to your floors. Allow it to air dry. The hot water and the lemon juice clean the floors, while the olive oil works to polish them. You don’t need to rinse the solution when you’ve finished, once it’s dry your floors will look great. For your floors that need regular disinfecting and deep cleaning, like your bathrooms and shower, this is a great homemade bathroom cleaner that does a fantastic job of disinfecting. The recipe uses borax, which can you can purchase at your local grocery store, in the laundry aisle or online. In a mop bucket, mix the water and Borax. Stir thoroughly to dissolve the Borax. Dip a mop in the bucket and wipe down your floors. Borax is great for cleaning up even the grossest of messes. Laminate flooring is relatively easy to take care of, but occasionally you may need to clean a mess that requires a bit more cleaning power. If you use the wrong kind of cleaning product, you can end up damaging the finish on your floor. This homemade laminate floor cleaner will clean your laminate floors without damaging them. Mix the ingredients in a mop bucket or spray bottle. Using a clean mop, soak it in the solution and mop your laminate floors. There is no need to rinse the mixture off. Let it dry. You can also clean your floors by spraying them with a spray bottle filled with the cleaner, then wiping it off with a mop. You’ll have to rinse your mop in the sink a couple of times when it gets dirty, but this way you won’t have to throw away any unused solution. The white vinegar you have in your home is extremely versatile and does everything from making pickles tart to shining mirrors. It is also great for cleaning a variety of kinds of flooring. It is strong enough to remove dirt and grime without damaging the finish. Make it even more efficient by adding a little liquid dish soap and baking soda. Add the ingredients together, stirring until all the clumps are dissolved. Pour the mixture into a spray bottle. Working in small sections, spray the solution onto the floor and mop it off. Be sure to rinse the floor thoroughly with clean water to avoid leaving streaks. If you have tile floors in your home, you can use some common household ingredients to clean away layers of grime, dirt, and dust. The cleaner will help to loosen the dirt while gently cleaning the tiles. The best part is they won’t leave a soapy residue. You can eliminate the need for stronger commercial cleaners by using this cleaner weekly. Fill a bucket with the ingredients, stirring well to dissolve the baking soda. Pour the mixture into a spray bottle. Working one section at a time, spray the cleaner directly onto your tiles. Mop the floor using a bucket of one cup vinegar and ten cups hot water. Allow time to dry. Cleaning your floors with a natural homemade floor cleaner is an excellent way to go green at home. Using natural ingredients that you can find in your pantry and essential oils can give your entire house a clean, fresh scent while getting rid of dirt, bacteria, and germs. We’ve provided you with several natural cleaning products that you can make at home. We hope you find them useful and share them with your family and friends.